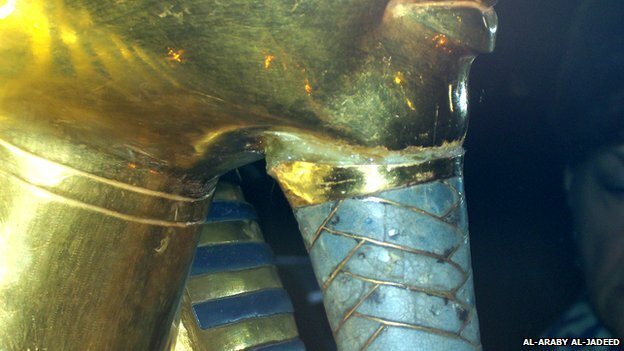 The Egyptian Museum in Cairo is making international headlines after disclosure that tee-shirted workmen hastily reattached the blue and gold braided beard of the iconic burial mask of the boy-pharaoh Tutankhamun. Some reports say the repair was made with epoxy known for its strong adhesion properties but also rarely used on archaeological objects because it is not fully reversible. Further, reports say that residue from the “repair” dried on the face as well and a second worked attempted to remove it with a spatula damaging it with scratches. There have been past reports of objects being mishandled and lacking proper conservation at the world famous museum but this is the first time it involves an object of such stature. Such heavy-fisted conservation certainly stands in start contrast to Egypt’s aggressive and heavy-handed attempts over the past two decades to repatriate ancient objects safely conserved with the utmost care and security in museum collections in Berlin, Paris, London.